Jo-Ann Fabric has their Entire Stock of Blizzard & Anti Pill Fleece Prints and Solids on sale for 50% off (In Store or Online). Check out the Craft Elf for instructions on how to make a No Sew Fleece Blanket. With no sewing needed, this blanket can be made by almost anyone. 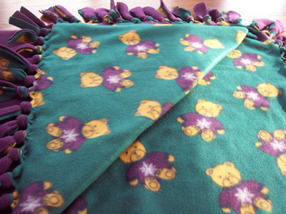 If you can tie a knot you can make this blanket.